Established in 1998 in Dubai, Emirates Glass is an ISO 9001 certified organization, which provides a range of high performance, energy-saving, spectrally selective coated glass products under the brand name EmiCool, manufactured to ASTM 2190 standards for insulated glass units and ASTM C1376 for high performance coating. It also manufactures an extensive range of sputter-coated, solar-control and thermal insulation glass products. Emirates Glass LLC is a subsidiary of Glass LLC, a Holding Company established and wholly owned by Dubai Investments (PJSC). Emirates Glass LLC was established in 1998 in the Al Quoz Industrial area of Dubai in response to the rapid growth of the local construction industry and has since developed as the leader in the production of processed architectural flat glass in the Middle East. At the heart of the Emirates Glass operation is the manufacture of MSVD sputter-coated high performance glass under the EmiCool® range of solar control, multi-functional low-E and standard low-E glass designed to minimize solar heat gain into air-conditioned buildings in the Gulf environment. Starting from a Leybold (Germany) 6-cathode coating line with a loading-bed of 2,440 x 3,600mm and an annual coating capacity of 750,000 square metres of MSVD sputter-coated glass, Emirates Glass has now progressed to a 20 cathode line from Applied Materials GmbH (formerly Leybold, Germany), a loading bed of 3,300 x 7,000mm and an annual capacity of 3,500,000 square metres of MSVD sputter-coated glass. This addition enabled Emirates Glass to enter a new and extensive market of post-temperable stock sheets for “downstream” processing into finished architectural glass products by customers themselves. The acquisition of the new Terra-G coater has facilitated the swift development and production of the innovative new range of Solite Double Silver, Elite Solar-low-E coating on clear and classic ST range of solar control colour coating on clear. 1. EmiCool® Plus T is a standard low-E with a nominal light transmission of 70 per cent. The coating retains the appearance of the substrate and can be used on surface 2 or 3. A U-value of 1.35W/m2K can be achieved with an air gap of 16mm and argon gas. Edge deletion is required. 2. EmiCool® Sun T is a multifunctional low-E that allows generous light transmission with low indoor reflection of 15 per cent and lower optimum g/SHGC value. A U-value of 1.25W/m2K can be achieved with an air gap of 16mm and argon gas. EmiCool® E-lite is a coloured solar control coating on clear glass with low emissivity property. The glass can achieve very low g/SHGC values with optimum U-value ratings as low as 1.25W/m2K with a 16mm air gap and argon gas. As the coating is applied onto clear glass, we can offer designers and processors a wide range of sizes readily available from stock. We also provide Elite in 3 Bluegreen variances (Bluegreen 30, 40 and 50). EmiCool® E-Lite Series provides assured colour consistency and exceptional RHG performance. This category has two products: EmiCool® ST and EmiCool® Classic T.
1. EmiCool® ST. Similar to the E-lite range, the EmiCool® ST series is applied on clear glass. It is a solar control coating that provides excellent colour rendering uniformity index and superior solar resistance. The colours available are gold, blue, green, grey, bronze, light grey and blue-green. 2. EmiCool® Classic T. Originally designed for hot sunlit climates, the product has a proven record of over a decade. More than 5 million square metres of this glass is installed in buildings in various countries around the world. This range has excellent colour uniformity and can be installed as single glazed spandrel. It does not require edge deletion. This product is the latest addition. Solite is a spectrally selective glass having a wide light transmittance range from 24 to 71 per cent. A U value of 1.1W/m2K can be easily achieved with 16mm air gap and argon glass and a g/SHGC value of as low as 15. Edge deletion is required. EmiCool® E-Lite is a high performance dual action solar control coating which is applied to clear float glass and offers the designer a unique choice of aesthetics. Unlimited sizes of options are made available to the designer as the coating is applied to clear float glass and the integrated solar control and low emissivity properties provide the client with wide flexibility. For architects, products from the EmiCool® E-Lite range provide vibrant external colours maintaining a neutral interior appearance. The visible light transmission range spans 14 to 38 per cent with U-Values as low as, without gas filling, of 1.43 W/m2K, SHGC Values to 12 and overall Relative Heat Gain down as 101 W/m2. The EmiCool® E-Lite range offers all sectors of the industry a truly flexible choice of post-temperable performance and size options that can be tempered, laminated and fabricated as high performing insulating glass units for any application. EmiCool® Sun NN Series has been developed as a range of low-E coatings which gives a neutral appearance of the substrate. The EmiCool® Sun T range of six coating options provides a multifunctional capability of good solar resistance and excellent thermal insulation, summer or winter. At the same time, EmiCool® Sun T allows generous transmission of light with low internal reflection, giving the appearance of clear or tinted glass when viewed from inside. EmiCool® Sun T is an insulated glass product with the coating on surface #2. Edge-deletion of Emi-Cool® Sun T is necessary prior to fabrication of insulated units. 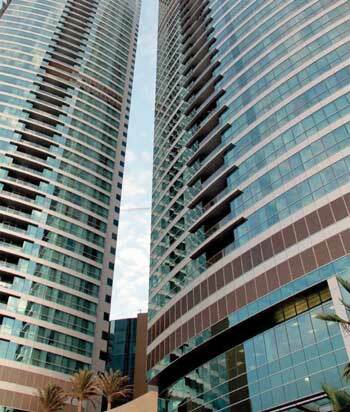 Emirates Glass has developed a range of glass options for the spandrel use that provide vision and spandrel harmony. EmiCool® Plus T is a MSVD sputtered low-E glass with a nominal light transmission of 65 per cent when applied onto clear glass. The coating is ultra-thin and retains the appearance of clear or tinted glass. It is ideal for applications requiring subdued colours, low reflectance and abundant daylight. EmiCool® Plus T is highly effective in blocking the transmission of heat in the near and far infrared (IR) wavebands and thus provides excellent resistance to ambient conductive heat-transfer (outdoor/indoor temperature difference). b) Single glazed EmiCool® High Performance solar control glass to compliment the appearance of the EmiCool® Plus T vision glass, and by using a shadow-box compromising insulated back-pan with a suitably painted finish. As a further option, the EmiCool® high performance glass can be supplied with a black polyester opacification film on Surface #2. EmiCool® Solar Control ST Series is an innovative, post-temperable colour coatings exclusively applied to clear glass substrates and readily available in stock. The product provides a high level of solar mitigation with a pleasant neutral appearance and low to medium external and internal reflectance. EmiCool® ST Series can be installed as a single glass, DGU, can be laminated and even curved. The product is an ideal choice for modern architectural design with consistent uniformity of the E = 3. EmiCool® ST Series is a natural aesthetic choice. The coating is applied to clear substrate providing a wide series of stock sizes and giving the designer and glass processor maximum flexibility. The visible light transmission range of the monolithic product spans 20 per cent to 58 per cent, external reflectance covers 9 per cent to 40 per cent and an internal reflectance as low as 3 per cent. For glass processors fabricating insulating glass units with a surface #3 low-E coating and without gas filling, U-Values of 1.62 W/m2K and a total relative heat gain as low as 109 W/m2 can be achieved. EmiCool® ClassicT is a large range of sputter-coated high performance glass with excellent façade-colour uniformity and superior solar resistance characteristics. EmiCool® Classic T coatings are durable and can be incorporated in sealed double glass units for vision glazing or as single glazing for spandrel panels. The facade-colour uniformity and durability of EmiCool® Classic T coatings makes them the natural choice for structural silicon curtainwall systems in which the structural silicon can be applied directly to the EmiCool® Classic T coating. Fabrication of insulated glass units as well as structural bonding of single-glazed spandrel panels do not require edge-deletion of the coating. EmiCool® Classic T can be used in single-glazed form as spandrel glass in all types of curtain-wall construction. Colour uniformity between vision and non-vision areas is assured when the light transmission of the selected EmiCool® Classic glass type does not exceed 14-17 per cent, depending on substrate tint. Opacification of Emi-Cool® Classic T glass can be carried out by means of a factory-applied black polyester film applied on the coated surface. When used in structural curtain wall systems, the opacifier filter must be trimmed back around the edges to expose the coated surface and to achieve proper adhesion with the structural bonding silicon. EmiCool® Solite is spectrally selective double silver low-E glass type that has been developed to provide architects with a solution to contemporary needs for high levels of transparency whilst giving optimum control over direct solar heat gain. A glass is considered spectrally selective when its light-to-solar gain ratio (LSG) is ≥ 1.25 as defined by the US department of energy. The LSG ratio is derived from LT/SHGC taken from the performance data tables. All EmiCool® Solite products show the LT/SHGC values as part of the product description and, by reference to the data sheet, the entire EmiCool® Solite range is seen to be substantially spectrally selective, with LSG ratios of up to 1.87. In addition, EmiCool® Solite range has excellent thermal insulated performance criteria, with U-Values typically 1.40 W/m2K for 28mm (6+16+6mm) insulating glass. High levels of transparency, clarity and excellence solar resistance are some of the impressive benefits of EmiCool® Solite range of spectrally selective low-E glass that is now available from Emirates Glass. Emirates Glass Technical Department, together with Emirates Glass Laboratory, are able to provide a comprehensive support service to customers and specifiers, covering all aspects of the specification manufacturer and installation of sputtered high performance glass. The company is able to review perspectives, drawings and specifications and to give professional advice on a wide range of matters concerning glass in building including colour, reflectance, solar resistance, strength, thickness. In addition, it provides a series of technical seminars to interested parties and its marketing and sales teams are available to discuss technical and commercial issues covering the entire range of EmiCool® high performance sputter-coated energy-saving glass. With its new 3.5 million square metre per year capacity now on line at Dubai Investment Park, Emirates Glass is now extensively committed to a position as a supplier of temperable annealed stocksheet low-E and solar control glass to the regional glass processing industry. To ensure that EGL MSVD coat glass is handled in a proficient manner, Emirates Glass QA/AC department collaborates fully with its customers in setting up a certified fabricator programmed covering an aspects of receiving, handling and processing through to finished product, also assisting customers further with full back-up in terms of performance data, review of literature and assistance in sales and marketing. 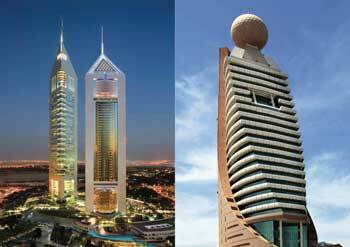 Emirates Glass LLC is one of the founding members of the Glass and Glazing Federation (G.G.F.) in the Middle East and North Africa Region. The G.G.F. is a European-based glass industry standards and advisory body with a global network. The G.G.F. has been instrumental in raising the international quality of standards and glass processing regulations to the benefit of both the architectural, public and industry worker communities. Being the industry authority, the G.G.F. promotes best practice and sets the highest technical and health and safety standards. The Federation is also the voice of the industry in local and national politics helping shape and influence policy and legislation. As well as offering an array of benefits to its members, the G.G.F. guides and protects clients and consumers when buying glass or glazing products and services. The G.G.F. in the developing and increasingly sophisticated markets of the Middle East and North Africa will make a major contribution to advancements in technology, health and safety and the burgeoning market for environmentally sustainable construction with glass. Emirates Glass is proud to be at the forefront of these developments with its own technologies and is committed to making effective contributions to a safer and more energy conscious world through its high performance products. Emirates Glass is equipped with two state-of-the-art Perkin-Elmer spectrophotometers for the complete analytical measurement of glass-performance data on physical glass samples. Each spectrophotometer comprises two fundamental components, which are: a Spectrum Ome FT-IR Spectrometer for the measurement of glass surface emissivity, and a Lamda 900 UV/Vis/NIR spectrophotometer for measurement of spectral transmission. Software was installed and commissioned by the renowned TNO Institute of Applied Physics in the Netherlands in accordance with European Standards EN410 and EN673 and American ASHRAE /NFRC 300/301/302 standards. Consequently, Emirates Glass can physically measure, with great accuracy, the spectral and thermal insulation characteristics of any glass type and can present the results on an official Glass Performance Analysis sheet, typically as shown opposite. The services of Emirates Glass Laboratory are available to architects and clients to verify the performance characteristics of EmiCool® High Performance glass for purposes of evaluation, selection and final specifications. To ensure full compliance with adopted standards, and to maintain accreditation to ISO 9001: 2000, Emirates Glass have a well-established QA/QC organization with extensive supervision and education on the factory-floor. Incoming raw materials and consumable items, as well as any glass processed by third parties, are subjected to detailed checking-procedures using, when necessary, appropriate instrumentation to ensure “fitness-for-purpose” of all EmiCool® glass products within the parameters set by major international standards. These processes are also implemented at every stage of production through to finished goods prior to despatch. QA/QC Personnel are available at any time to deal with any quality issues that may arise at Customers premises, or on site, following delivery or installation of EmiCool® glass. EmiTherm® insulated glass and EmiCool® high performance coated glass products are supported by a comprehensive 10-year standard product warranty. What position does Emirates Glass hold in the glass industry in the UAE? And in the Gulf region in general? Phil, National and International Sales Manager Emirates Glass: Emirates Glass LLC, a subsidiary of Dubai Investments PJSC, is one of the largest processors of flat architectural glass in the Middle East. Established in 1998 in Al Quoz Industrial City in Dubai, Emirates Glass has become the dominant supplier of sputter-coated energy-saving glass throughout the Gulf region with a market extending even further to Hong Kong, Johannesburg and London. What is the ownership structure of Emirates Glass? 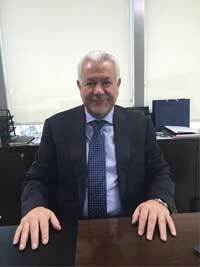 Phil: The first glass holding company in the Middle East, Glass LLC was established in 2006. Wholly owned by Dubai Investments PJSC, Glass LLC, through its various subsidiaries, provides premium quality glass solutions to all major industries including automotive, construction and security. The company has a capital of AED 400 million and investments to the tune of AED 1.1 billion and is the leading supplier of glass in the region. Glass LLC coordinates, monitors expansion and regulates production as well as invests in research and development of new and innovative products to meet the changing needs of the market. Please describe your product ranges, including any new developments. How will the product range be developed in the future? Phil: Emirates Glass, through its EmiCool® range of energy-saving glass, has already played a huge role in the regional market and has been involved in many of the iconic buildings of our time. • EmiCool® Classic – comprising a series of thin, sputtered metallic coatings which are highly effective barriers to direct solar energy impact and are perfectly suited for use in structural silicone curtain wall systems. • EmiCool® Plus – a standard low-E glass type with relatively high light transmission and good thermal insulation, suitable for buildings where glass areas are relatively small. In addition to this extensive range of solar control technology, Emirates Glass also launched a new range of spectrally selective products. The new addition of Solite and Caribia ranges allows architects and specifiers to increase light transmission in construction without sacrificing thermal performance. The range has been accredited as a major contributor to achieving L.E.E.D. certification. Lumiglass laminating into a commercial portfolio. The merger provides market access to a wide range of Armour-Lite safety and security products with enhanced solar control performance. Any upcoming product launch or innovation from Emirates Glass? Phil: I love the word innovation because it ties together three business principles that are very much required in business today: New Ideas, Original Concept and Creativity. Our product innovations. Are a secret but I can assure you that any new product launched at Emirates Glass will comply with the true meaning of the word “innovation”. To be a successful supplier to the architectural glass industry requires the ability to read future design criteria but this is different from one region to another. I believe that in the future we will see a swing back to more colour in facades and this will require our supply to accommodate this trend as well as provide glass that meets the highest performance for fenestration management, that is, increased light transmission and decreased solar heat transmission in building windows. Please describe the recent investments in your coating and tempering facilities. Are there are future plans for expansion? Phil: To meet the enormous challenge of a rapidly growing market, Emirates Glass recently completed a huge capital expansion programme to increase capacity in glass-tempering, double-glazing, cutting, edge-working and drilling. This expansion cater to the demand for highly complex glass types, now commonly seen at airports, shopping centres and hotels. 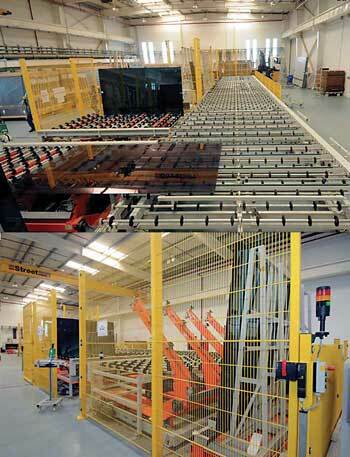 Emirates Glass has acquired new coating line from Germany. The line increases capacity to 3 million square metres per annum and will place Emirates Glass as the largest producer of energy-efficient glass in the Middle East. Are you exporting outside UAE? If so, where? Phil: Emirates Glass has emerged as one of the leading providers of energy efficient architectural glass in the Middle East with a rapidly growing market stretching from the UK, Europe, and Russia to Singapore in Asia. In general, what is the key to successful partnerships with customers? Any principle you can share that would lead any contractors, engineers, and consultants to partner with Emirates Glass? Phil: Emirates Glass has been an industry leader in the UAE for many years; this has been an achievement, as the company is not recognized as an international player like most of our competition. We experienced market boom times before and 2010 in the UAE and yet have been able to maintain steady business growth throughout the times of economic recovery. The future for Emirates Glass will be based on our years of local experience and this is a strength that we need to promote more throughout the industry. Our ability to provide a wide range of products is a major advantage for us, these are facts that I am sure would attract closer industry partnership. As a company objective we need to provide premium service for the supply of our products that goes beyond customer service. I hope that in the next few years our customers will come to appreciate the level of “Customer Care” that Emirates Glass provides, as this style of support will be paramount to our business achievements and continued success. 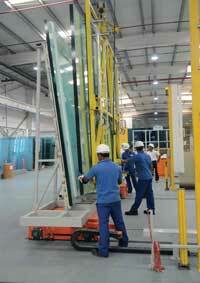 How does Emirates Glass differentiate itself from competitors? Phil: There is a difference between “comparable” and “competitive” advantage and at Emirates Glass we aim to provide both values to the supply of our products. With a lower cost of production we provide a comparable advantage; and with an extensive product range we provide a competitive advantage for the unique selection of coated glass products to provide the ideal product choice. This flexibility in supply extends to a wide range of coating types and glass substrate options that provides our customers with a superior advantage and helps us to forge market niche to all market regions. 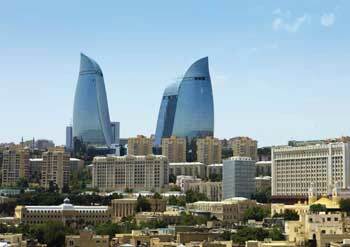 What are the prevailing market conditions for the glass industry in UAE in general? Phil: The architectural glass business for the past 27 years of my career has one unchanging characteristic that can be summed up in one word “change”. Technical development of the coated glass industry has dramatically progressed in the past 10 years and today there is a constant need for more improved products that meet higher performance standards. Architects want more light and less heat to come into buildings today, but they also need diverse options in product choice to meet a broad range of design criteria. Being able to meet new challenges in the glass industry will be the success of a company in the UAE industry. I see that the next three to five years will bring the need for better products, new improved products and bigger window sizes as architectural design pushes the boundaries of processing practicality and capability. But this has been that the way of the industry for many years, it’s change but change that is constantly evolving to ensure improved project design achievement and accomplishment.